Paula’s Choice Skincare is known for our range of alpha hydroxy acid (AHA) and beta hydroxy acid (BHA) exfoliants. Alongside the daily-use exfoliants, we have a group of high-strength facial exfoliators that you can use for enhanced results. Each concentrated formula uses a special delivery system to ensure your skin is treated gently without losing any of the benefits high-strength exfoliants provide. That’s our idea of win-win! Think of our high-strength exfoliants as the heavy hitters (but still light in texture) when skin needs something more to deal with stubborn issues. You’ll find that concerns like stubborn clogged, enlarged pores, more pronounced texture and skin tone issues, bumps, and wrinkles respond wonderfully to any or all of these targeted solutions—and it’s OK to alternate them, too! Best for: All skin types showing advanced signs of sun damage, deep wrinkles, dehydration, and dullness. What to expect: Dramatically smoother, more radiant skin, visibly increased firmness, a more even skin tone, and diminished appearance of wrinkles and crepe-like texture. How often to use: Apply once or twice a day after cleansing and toning. During the day, be sure to follow up with a broad-spectrum sunscreen rated SPF 30 or higher. Best for: Normal to oily or combination skin showing signs of aging and breakouts at the same time. This controlled-release formula is even suitable for skin prone to milia. 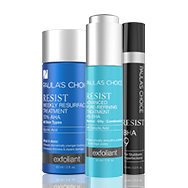 What to expect: A fast reduction in the appearance of enlarged, clogged pores. You’ll also see fewer fine lines and wrinkles, reddened areas will appear more even, and rough texture beautifully smoothed. How often to use: Daily or a few times per week. At night, apply this gel-serum to areas of concern, either alone or over your usual AHA or BHA exfoliant. Or, apply your usual exfoliant to certain parts of your face (cheeks), and this treatment to the oilier, clog-prone areas, such as the forehead, nose, and chin. Best for: All skin types struggling with stubborn imperfections, from hard white bumps to resistant clogged or enlarged pores and markedly uneven skin tone. Suitable even for sensitive skin prone to milia. What to expect: Your go-to solution when nothing else has worked. You’ll see signs of stubborn bumps, clogs, and multiple signs of aging fade away. Skin takes on renewed smoothness and evenness. How often to use: As the last step in your nighttime routine, apply a thin layer of this serum-like gel as often as needed, either as a spot treatment or all over the face (if you have multiple areas of stubborn concerns). May be applied over other exfoliants but pay close attention to how your skin responds.